Normally, whenever I think about horror writers who’ve greatly influenced the genre in both literature and film, names like H.P. Lovecraft and Stephen King come to mind as those who’ve left quite the mark on all things macabre. Still, it remains a simple fact that everyone had to jump aboard somewhere, and it stands to reason that the work of R.L. Stine probably served as the gateway to horror for many readers, some of which may be viewing this very article. To be honest, I dabbled only ever so slightly in Stine’s body of work as a kid, but I do remember my classmates being enthralled by anything that fell under the umbrella of Fear Street or Goosebumps. In fact, one could easily argue that the latter was a greater success, spawning a TV show, comic books and even a movie in the years since its debut. Given that, it comes as no surprise that said film has yielded a sequel, one that’s been gestating for some time now. In this case, it’s Slappy who’s headlining and looking to join various other big names in what we’ll term as “Doll Valhalla,” a place we imagine is populated by the likes of Chucky, pretty much anything that’s been in a Charles Band movie and, my personal favorite, Seinfeld‘s Mr. Marbles. This film will feature one of the series’ more notorious villains: Slappy, the evil ventriloquist’s dummy who’s hell-bent on jump-starting the Halloween apocalypse. Three friends must stop the stuffed adversary before he ruins Halloween for good. Jack Black, who depicted the author in the first film, will reprise his role as Stine in the sequel. Additionally, Omega Underground reports that Black will also be voicing Slappy himself, and that those “three friends” will consist of 17-year-old Sarah, her brother Sonny, and Sonny’s best friend Sam. 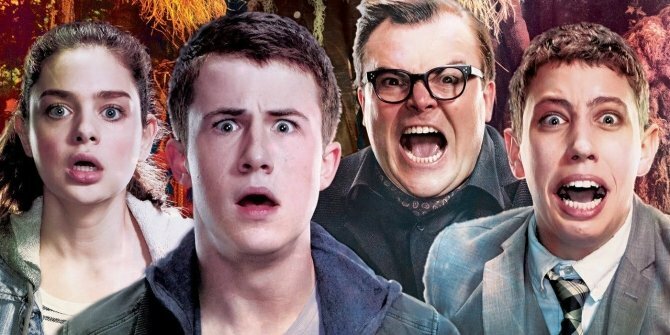 Goosebumps: Slappy’s Revenge opens in theaters on October 12.